I’ve been meaning to drop you a note to tell you how my project went. Bryan and his crew did a great job with the building. Where do you find young kids that will work like that? All I've seen, just want to play video games and have money handed to them. I am very pleased with the building and it is providing me with more finish work than I really care to do. I will recommend you highly to all of my friends. Thank Bryan again for me and thank you for such an easy transaction. Wishing you all the best,"
Sending pictures of our shed after paint. You guys did a fantastic job thank you so much." "We are so pleased with the building and Bryan and his crew." Y’all do great work at a great price! I love my little shop shed! So much more room than I had before! Bryan and the young men did a great job! Thanks again! Very happy!" Just a quick note, letting you know we are really happy with how the shed turned out. Brian and crew did a great job in a tough location and were a real joy to work with. We pretty much have the painting done and it looks great! "I’ve used Affordable cabins and Sheds for a clients shed, did it for not much more than it would have cost me to use my own guys. Totally impressed by them will defiantly use them again." "We had a 10×16, 8/12 pitch gable built 2 weeks ago. Absolutely love it, can't say enough about Marty and the crews outstanding job. We shopped around a lot. Where we had it built in our yard, we felt a build on site was the best option. These guys are good at what they do!" I wanted to let you know that I was impressed with their (Bryan, Sam, and Peyton) hard work. They got with it all day long, no stops for anything except lunch. Very impressive!!!" Your team (John & Greg) just finished the 12×12 building and we are very happy with the finished product. Also, I wanted to thank you for the crew that came and built the building. They worked in between several rain delays and still finished before dark. They are to be commended. We just wanted to let you know that the guys did a great job on the Shed and we are very pleased. Thanks Again!!" We got our barn painted. Thank you and your team for great job done. Hope to do a guest cabin next couple years. Thanks Again…." We can’t thank you enough for everything you and your crew (Bryan & Sam) have done, with so much EXTRA effort. We are blessed to have come across a company with such integrity as yours. Thank you from the bottom of our hearts. We are forever grateful!!" Thank you again for being able to install our shed so quickly. We love it! You’re crew was awesome and efficient!" I just wanted to take a minute and say thanks. John and his helper really worked hard on my shed and I couldn’t be more pleased with the finished product. I looked at lots of companies and none came anywhere close to the quality you provide. If I ever run across anyone in the market for a shed you can be sure I’ll recommend you." We could not be any more pleased with our shed! Your team did a wonderful job and were very professional, neat and capable! We are so happy to have a place for our outside 'stuff'! We had been storing it under the eaves on the backside of the house. Jimmy has already moved into it, and is quite satisfied." "Thank you for a wonderful job. Brian & Sam were very professional & they know there stuff. They arrived about 7:00am & worked fast & hard. I would recommend you guy's to anyone." I went by yesterday and saw the shed. We just wanted to let you know that they did a fantastic job! It looks great, and we are very pleased Thank you so much for working us in so quickly and being so easy to work with! I hope you have a great rest of the week." "Levon and his team were AWESOME and we love our new shed. Multiple people have commented on how sturdy and well-built it is, especially compared with those kits you could get from a home improvement store. I'd highly recommend Levon and his crew to anyone. They were a super fast, efficient, skilled and courteous team." "Just finished painting my new shed. Affordable Sheds are the best. I have been telling everyone that they need to call you guys. The crew came out and were very polite. They started at 7:15 am and were gone by 12:15 pm. It looks great and will last a lifetime. Thanks Marty." "Folks, let me start by saying that we LOVE OUR BUILDING! My wife and I have been wanting a shed for a couple of years now – so, this year we decided to go ahead and get it. We researched and put out feelers about where we wanted to buy one from and got nothing but confused in the process! Everywhere we looked, it was the same story – a lot of companies offered what THEY wanted to sell you…..a pre fab unit, very few choices, and on their terms! So, we turned to prayer and sure enough, a co-worker heard we were looking for a shed and HIGHLY recommended Affordable Cabins and Sheds! Upon making the first call, Marty was very professional and put me at easy about this venture. He was polite and was not afraid to reference the bible, God, or Christianity! After deciding what WE wanted – the logistics we set in place and the transition was very smooth! Levon and his crew showed up and explained the process in detail. They went to work and did a truly phenomenal job! 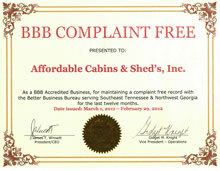 we are very satisfied and highly recommend Affordable Cabins and Sheds! Thank you guys so much for the great experience – now we are the envy of our neighborhood!" "Just wanted to compliment your crew Bryan, Sam, and Shannon) that came out today. Fantastic job! Courteous, prompt, and good craftsmen. Good group!" "Thank you so much for getting the building done early! My neighbor sent me pictures and it looks great!! Can’t wait to go see it in person! Again, thank you so much! God bless!" "Just wanted to compliment your crew (Bryan, Sam, and Shannon) that came out today. Fantastic job! Courteous, prompt, and good craftsmen. Good group!" The building looks great. John called me Thursday to let me know they planned to arrive at 8:30 Friday. He and Billy actually got here at 7:30 Central Time (8:30 Eastern). We finalized the details on the placement of the barn doors and the two windows. They began work immediately and worked hard all day. By 4:00pm they had finished the building, cleaned up the area and loaded the trailer for their return. They were polite, efficient, and had a great work ethic. They are valuable resources for your business. Thanks for a fantastic experience." "I would like to thank you for the crew (John, Billy, and Chad) you sent here. Hard working, professional group. Thanks." I just wanted to touch back with you. The shed is awesome! I finally finished getting it painted. Thank you!" Your guys (Bryan & Sam) did a great job. I’m real pleased. Thank you again." "1 Year later our shed looks just as good as the day you guys built it! So please with the quality. Thanks so much." "We are very excited with our new shed. The crew (Bryan, Sam, and Shannon) did a great job. Thank you for coming out our way." "We couldn't be happier with our building. The size will be just right for our needs. The crew ( Levon, Jessica, Tanner & Q) were exceptional. They offered advice when asked, their work was high quality and they worked quickly. They cleaned up when finished and we're all around great folks to work with. Marty and Terry took great care of us, even though I called them with lots of questions. We'd definitely recommend Affordable Cabins & Sheds to everyone. Thanks again." "Brian, Sam and Shannon did a Great Job on my shed. The Shed was built in a very fast and efficient manner. I can see why you stay so busy in this business. Thank You for a Job Well done!!" I seem to remember you wanted a picture of the painted shed for warranty purposes. We painted it today, I've attached picture of it. We're really enjoying the shed, thank you!" Just wanted to send picture to show that the barn is painted for warranty purposes. We’re really enjoying all the storage space. Thanks again for such a quality building." The guys did a fantastic job today building the shed. Its top-notch quality and the work shows it. They (Bryan, Sam, and Conrad) came about 6:30am and were done by 3 pm. They were professional and answered any questions I had. I will enjoy having this shed in my back yard. Thanks"
Really nice building. Far superior to the portable buildings. (Installers: Bryan, Sam, and Conrad)"
"The shed install went smooth yesterday, and the crew (John & Cody) seemed very competent and friendly. The best part was that it was complete in 5 hours. Great experience overall. Thanks"
"Last Thursday your people put up a 10×12 shed for me. I just want you to know how greatly impressed I was with the energy and go Get-Em your crew had. You sent out Levon and his crew. From 8am to 5pm they were in atrocious heat. They were efficient and it was easy to see they knew what they were doing. There was never any lost motion in anything they did. My next door neighbor has a green shade of envy from looking at it and I won't be surprised if you hear from him." "I can't fully describe in words how impressed I've been with all aspects of the process of having my 12×28 barn style shed built. When I first Googled shed builders in N Georgia I searched many sites, but when I found there's I was very impressed. I really liked how they listed all the styles, prices and extensive gallery of photos. When I e-mailed them I got a quick response and f/u phone call from Terry. My first question was did that include labor? I couldn't believe there prices. They weren't much more than the DIY kits I had looked at. From there on the process was quick and easy. I scheduled the build and they gave me the week it would be done, when that time came I set up a day with Marty. The night before I got a call from the building crew and they showed up on time to start work; and work they did. John and his young partner Cody put in a 14 hour day on one of the hottest days in a while and built my huge shed from scratch in one day. There craftsmanship was as good as there manors and work ethic. Mike Rowe would be proud. At the end of day they cleaned up the job site and made sure I was satisfied before accepting payment. I'd also like to say the building materials used were high quality. Trust me when I say if you see anything on their website you want built you won't be disappointed. The name really says it all, Affordable Sheds and cabins." "With very little work and money, we were able to insulate the whole inside of our workshop, build a loft, put plywood on the inside and build a ramp. I wired it first, then did all the interior work. It added a lot of strength to the building, not that it needed it. They (Levon and his crew) did such a great job building it on our lot, but it is hot down here so we insulated the walls, ceiling and then put plywood over it. I love the job you all did, sturdy, and accepted the paint after curing perfectly. Happy about the job, price. Thanks again." "I am very pleased with my new shed. Everything that Marty said would be done was right on, the date the price, the workmanship, and the clean-up. We highly recommend this company for the quality of work and the people who do it (Bryan and Sam)…"
Love my new building. It is above and beyond what I expected. Levon and Brandon and the crew was so professional and went out of their way to insure that I was pleased. Such good workers who are not ashamed to let GOD shine through their life. Will recommend to everyone"
I can say I did inquire on a number of different shed suppliers in the the tri city's and when I came across their add on Craig’s list and I needed to call. I was very pleased with Terry when he and I spoke on the phone and when he ended the conversation I was pleased to know that I believed I was working with like minded people. I'm moving our family to north east Tennessee after owning our auto repair business for the last fifteen years so I know a thing or two about customer service and how the person on the phone can make or break a new customer. All this being said I think I have only written one or two other reviews in my life. When I called I was told they where approximately four weeks out and with us still going back and forth between homes I really needed something a little faster and let Terry know that. So after thinking about it for a day or so I called back to art it up and when Marty called to get the timing down he told me he may be able to get me in in a week and I was amazed and when the night before came I got the call from the crew leader Levon and I was pleased to know that these guys do go the extra mile to do what they can to accomplish what they say. The next morning Levon , Branden and Matt showed with the billy trailer loaded and ready to hit it. I really enjoyed the crew as they where fun to work with cause with my personality it wasn't long before I jumped in to lend a hand as I have built many structures myself but this time I didn't have the time or the help. I can say Levon runs a non-stop crew and I almost had to make them stop for a few minutes when I went to pickup some lunch for them. On a personal note the crew I received on my site was like minded to myself and my family and once again I was pleased that I choose this company if not for any other reason but the fact that they are believers in my Lord and Savior Jesus Christ. I know a lot of people want to hear about the shed and such but I think the people are much more important to me then the shed don't get me wrong the shed was well built and everything I was promised in the contract. As it was in my auto repair business it is the people that make the difference and there is a lot of bad contractors as well as auto mechanics so take it from me when I say the people matter most. I can say that when it was all done and the boys went home ( 3 hour drive ) I did find something out of place and needed fixing I call Marty and within minutes Levon was calling me to go over it. I always told my customers that I will make a mistake now and then and when I do please judge me for what I do about it do I take care of you or make excuses and I can tell you I was very successful for that reason. Levon and I talked it over and I told him it wasn't an earth shattering problem and hated to have to have them come all that way but it needed to get handled and Levon stepped right up and told me he would get it handled and on Good Friday he came up to fix the problem. SO LIKE I SAID IT IS THE PEOPLE MORE THEN THE PRODUCT FOR ME. Cause if you have good people you will have a good product. So if you all are wondering yes I will probably have another shed built and it will be by affordable sheds and it will be by Levon Brandon And Matt Lord willing they are all in good health and all together at that time. Thanks for reading all my rambling and hope this helps you make up your mind on what type on people you want to give your hard earned money to and feel good about it." "I am very pleased with my new shed. Affordable Cabins and Sheds is a well ran company, and a pleasure to deal with. The price quoted was the price paid. The date scheduled was the date it was built. The quality of craftsmanship by Levon and his crew was impressive. They made sure that the floor was exactly square and level. Every wall was exactly square and plumb. There are no "that's close enough" gaps or cracks anywhere. This type of work ethic is rare in today's world. I come from a construction background and can tell if it is done correctly, and this crew did. I would highly recommend Affordable Cabins and Sheds, and especially Levon's crew!" 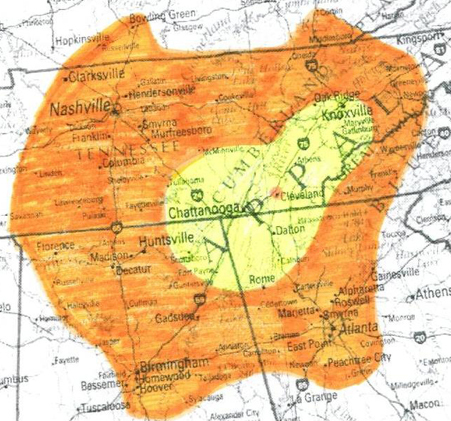 "This is a great company. Marty and his staff are super friendly and professional. The crew (John, Mike, and Cody) arrived early and finished my building, a 14×24 Barn roof, in one day. If you need a building you won't go wrong with them. Highly recommended! 5 stars!" Purchased the 12 x 20 storage building at the home show in Chattanooga. I was sold by the quality of the building at the show. Crew of Levon, Brandon and Matt was on site by 7 AM. Very organized from the loaded trailer to the shed completion at 4PM! I have never seen a crew as efficient as these three! Not a wasted motion the whole day. It was joy just to watch these guys work, better than watching HGTV!! (May need to send these guys to Washington!). They were very meticulous. If a nail wasn't straight, it was pulled out and re-nailed. Building looks great and the construction is near perfection! Highly recommend the crew and building!" "I couldn't be more pleased with my purchase. Great owner, manager and fantastic crew (John, Mike and Cody) that came out. I would recommend them to everyone looking to build a shed. I thought their prices were too good to be true, but after much research, I couldn't find anything negative about this company. Just good, christian men staying honest and not ripping people off. 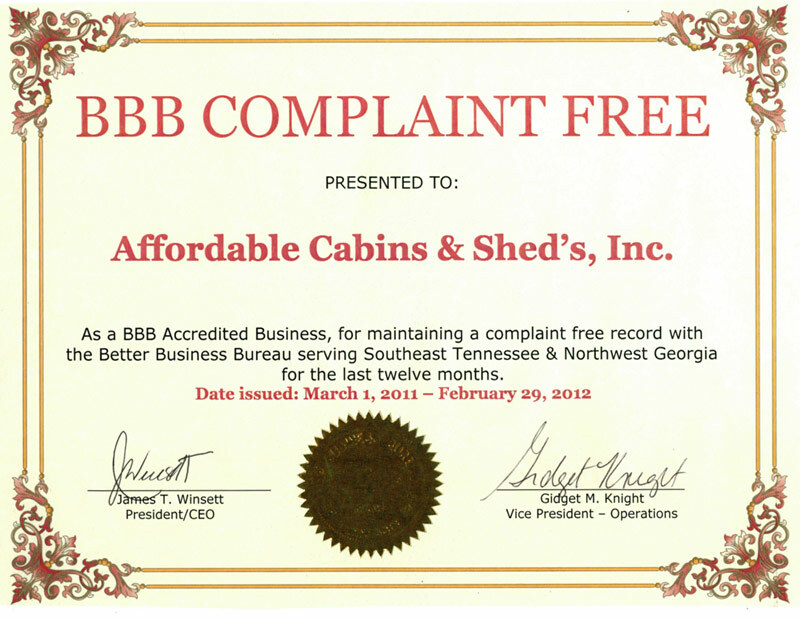 Thank you so much Affordable Cabins and Sheds, I will be sending plenty more business your way!!!!" "Great job by Levon Ivey and Brandon Goins, Shed looks more like a small house. Beautiful job, couldn't have done a better job. Glad I contacted Affordable Cabins and Sheds I am one happy customer." "Wanted a shed for a great price using great materials. Called Marty and set it up. Mike W and his guys came out in morning and by 530pm was packing the trailer and left me with an awesome looking shed. Shed has plenty of pressure treated wood all over it and looks like it’s going to last a long time. Very well built and the guys were super nice. Highly recommend. Mike W and coworker were very knowledgeable and the end product is beautiful." I would just like to thank the affordable sheds crew (Bryan, Sam, and Cody) for all they did in helping build our little home away from home. The guys were very accommodating with me being from out of town. They all worked in a fast and professional way and I really appreciate the distance they drove to come build it. I would highly recommend these guys to everyone."